The Panasonic Lumix DMC-LX7 was introduced in July, 2012 and includes a number of refinements over its direct predecessor, the DMC-LX5 (there was no LX6, in spite of the rumors circulating of a compact boasting a 1-inch type sensor). Like its rivals in this segment, the LX7 ditched the long-standing CCD sensor for a 10.1-Mpix 1/1.7-inch type MOS type (CMOS based) sensor allowing increased sensitivity up to ISO12800 (with boost) and full HD (1080p) video at 60/50/25fps. At 720p, output is 30/25p but there’s a potentially creative 100fps high-speed option as well. The DMC LX7 can also boast of a classy Leica branded image-stabilized 4.7-17.7mm (24-90mm equivalent in 35mm terms) Vario-Summilux zoom lens with a variable maximum aperture of f/1.4-2.3. This is instead of the slower Vario-Summicron (f/2.0-3.3) designated zoom of the LX5. Although a slightly shorter focal range than most current rivals, it’s the equivalent to a 24mm at the widest setting and it’s the brightest available for low-light photography. It also focuses to 1cm (0.39-inches) and features Panasonic’s Nano Surface Coating for reduced flare and ghosting. Not only that but it rates as one of the most impressive lens specs we’ve seen in a compact. Of the 11 elements in total, two are made from ED glass (with one of those being a double sided aspheric) while a further four also make use of aspherical technology, making a total of nine aspherical surfaces in all. Weighing just 298g (0.66 lb) and measuring 111 x 68 x 46mm (4.37 x 2.68 x 1.81″) the LX7 has a decent but fixed 3.0-inch (920k dot) LCD, however this is one of just two models (the other being the Olympus XZ-2) that can use an optional articulated electronic viewfinder (EVF), greatly enhancing usability. This segment is hotly contested and at $450 (finder extra), the LX7 isn’t exactly cheap (although it is one of the cheapest), so let’s see how well it did in our lab and if it’s worthy of your cash. The predecessor of the LX7, the CCD-equipped version, the LX5, achieved a DxOMark score of 41 and is currently ranked 178th globally in our database. So the DxOMark Score of 50 for the new LX7 indicates some improvements in sensor capability. Overall with a DxOMark Score of 50 the LX7 means it is ranked 173rd against cameras of all formats, and comes 9th out of the compacts tested (at the time of writing). The DMC-LX7 has surprisingly good Dynamic Range (11.7 Evs), the best we’ve seen from Panasonic and even surpasses the firm’s cameras using 4:3 sensors. Of those smaller sensor compact cameras, it ranks 7th in our Portrait use case test with a Color Depth of 20.7 bits (up from 19.6 bits for the LX5). While on the low-side (22 bits is considered excellent), this is a good score and plenty sufficient to provide nuanced color discrimination at base ISO. Panasonic hasn’t fared well in Dynamic range measurements previously, however, in the Landscape test, the LX7 scores highly with a very impressive Dynamic Range of 11.7 Evs (at base ISO). This is higher the firm’s larger size 4:3 sensor in the Lumix G-series cameras, though this wouldn’t be noticeable in real world use. Nevertheless, this is almost 1Ev extra exposure range over the LX5 and places the LX7 5th in Dynamic range out of the compacts in our database. Up to now the new sensor has performed admirably but the LX7 falls down in the low-light category coming 23rd in the compact camera category (and 191 overall in our Low Light scores). The Low-light ISO score (just 147 ISO) is a bit low when compared with its main rivals but the result actually shows an improvement over its predecessor when set at high ISO (ISO1600 and above). The LX7 is pitched against some stiff competition from the likes of Canon with the new 12-Mpix G15 with its stabilized 28-140mm f/1.8-2.0 zoom and Nikon with their 10-Mpix P7700. The Nikon is competitively priced at $500, boasts a flip-out screen and the largest zoom range (7.1x) equivalent to 28-200mm f/2.0-4.0 (with VR). Compared to the Canon, the LX7 has a similar performance and even out performs it in the Portrait use case, with nearly 1.0 bit extra Color Depth, however, the Canon has the higher res sensor of the three. With an overall DxOMark score of 53, the Nikon’s image quality wins out here. Although all three are even in Dynamic Range the Nikon has consistently higher scores with the best Color Depth of the trio at 21.1 bits and the best Low-Light ISO performance. Set to low ISOs the sensor in the LX7 is a very capable performer and ahead of the Canon but it is not so convincing at high ISOs where the P7700 just edges ahead. While the measurements are very close, in real world terms it may just be possible to see some of the differences in image quality. Needless to say, while the Nikon has the widest optical zoom range equivalent to 28-200mm, the Panasonic’s wider angle of view (equivalent to 24mm at its widest) remains attractive for shooting interiors and landscapes. If we compare the LX7 to its predecessor the LX5 we can see the decision to switch sensors (from traditional CCD to CMOS type MOS) was entirely justified. There’s 9 points difference in the overall DxOMark Scores with significant improvements in both Color Sensitivity (a 1.1 bit enhancement) and close to a stop extra (0.9Ev) in Dynamic Range (and not just at base ISO). The LX7 has an extra 0.87Ev in exposure range at base ISO over the earlier LX5, but it’s not just restricted to low ISOs meaning highlight and shadow recovery will be improved at any comparable ISO setting. With a 1.1 bit difference in favor of the Panasonic LX7 at base ISO the new sensor shows superior colour discrimination to the CCD found in the LX5 and also shows a consistently improved performance throughout the sensitivity range. As well as one-stop improvements in DR and Color Depth over its predecessor the LX7 also has better low-light performance at higher ISOs. While the Low-Light scores show a negligible difference (ISO147 vs ISO132) the LX7 shows some qualitative gains at high ISOs (from ISO 1600 onwards). This combined with the brighter lens means the LX7 is a bit more suited to available light photography than the LX5. All in all the MOS sensor in the LX7 shows improvements in every area over the earlier high-quality CCD of the LX5 and puts it squarely in contention with the latest offerings from rivals. 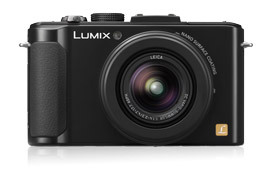 From the time of its introduction in 2005, the high-end Panasonic Lumix DMC-LX series has provided an attractive alternative to the mainstream (and longer running) G-series from Canon as well as the popular and more recent Nikon CoolPix P7000 series. Apart from the diminutive dimensions and low weight, the LX series offered very high image quality from the combination of a high-grade image-stabilized Leica-branded zoom and what was originally a wide-aspect ratio (16:9) 1/1.65-inch sensor. Over the various iterations this has been replaced with a more conventional 4:3 aspect ratio 1/1.7-inch CCD and now MOS type imager in the LX7. As such with comparable imaging performance in all areas (with the exception perhaps of Low-Light ISO scores) the LX7 represents a serious challenge to both the Canon PowerShot G15 and the Nikon Coolpix P7700. The Leica zoom doesn’t match the focal range of either but the LX7 has an attractive range nonetheless. However, if greater low-light performance is critical, larger sensor compacts such as the Canon PowerShot G1X or Sony RX100 should also be considered.